Tesla on Thursday unveiled its electric Semi, with CEO Elon Musk declaring it took into account “safety for everyone” but giving little detail about non-electric safety measures of interest to body shops. Asked about the actual vehicle body materials — aluminum, carbon fiber or other composites seem likely candidates given the range and speed Tesla hyped — a Tesla spokeswoman declined comment, referring us to the Tesla press kit. Of course, advanced materials aren’t necessary a given. Daimler opted for more conventional substrates to lower the cost of ownership for its 120-mile eTruck. “The Tesla Semi’s all-electric architecture is designed to have a higher safety standard than any other heavy-duty truck on the market, with a reinforced battery that shields the Semi from impact and gives it an exceptionally low center of gravity,” Tesla wrote. The truck can go 0-60 mph in 5 seconds and take a full load of 80,000 pounds from 0-60 mph in 20 seconds, according to Musk. For a typical diesel truck, these numbers are far higher, he said. 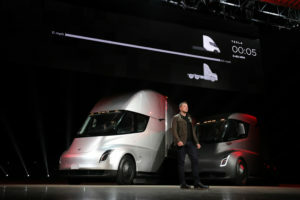 The Semi’s range is 400 miles and charging can take as little as 30 minutes, Musk said, noting at that long of a drive, the trucker would be legally required to pause for 30 minutes anyway. He also observed that unlike a diesel truck, an electric truck could be charging while the driver unloaded it. One thing we do know from a body perspective: The windshield is stronger than conventional truck windows, according to Musk, who called this an important consideration. Legally, truckers aren’t allowed to drive with a cracked windshield, which happens about once a year, he said. Part of the Semi’s performance comes from its extremely low coefficient of drag — 0.36, compared to what Musk said was a Bugatti Chiron’s 0.38. However, one version of the truck shown Thursday lacked side-view mirrors — which play hell with aerodynamics — and appears to rely on a small-profile side camera system to deliver such views, something confirmed by TechCrunch. While probably superior (unless the cameras break or are uncalibrated), ditching mirrors technically isn’t legal yet; Musk apparently is hopeful the trucking industry can get the laws changed by when production starts in 2019. If this happens, then the same case could easily be made for passenger-car mirrors — which would change every body shop’s business a bit. 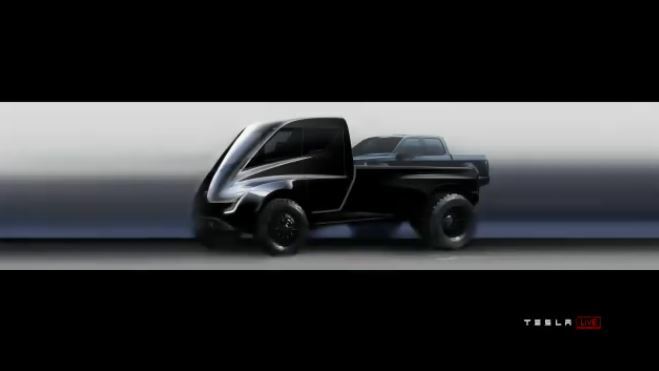 Musk said the Semi is equipped with side flaps which adjust themselves automatically based on the position of the trailer to deliver greater aerodynamics, which is interesting from a body repair standpoint as well as a concept for super-duty-type pickup trucks. The Tesla spokeswoman also declined comment on if Tesla Approved Body Shops would be considered qualified to work on collision-damaged Semis, or if Tesla would be establishing a heavy-duty-specific network. What perhaps matters more to non-heavy-duty collision repairers is Musk’s assertion that the truck, which has four independent motors on four wheels, will be able to prevent jacknifing by dynamically adjusting each wheel. “Your worst nightmare is gone for this truck,” he said. Assuming everyone else with electric trucks develops such a system — or doesn’t have it already — that’s going to reduce some accidents. “Jackknifing is prevented due to the Semi’s onboard sensors that detect instability and react with positive or negative torque to each wheel while independently actuating all brakes,” Tesla wrote. The government has mandated all large trucks and buses have electronic stability control by 2019, anticipating it would cut 40-56 percent of “untripped rollover crashes” at 14 percent of “loss-of-control crashes.” ESC does to some degree what Musk is describing by computer-controlling each individual wheel. According to government statistics, that means between 1,424 to 1,759 fewer crashes for private-passenger and heavy-duty repairers to fix. The Semi also is less prone to rollover, given the low center of gravity of the really heavy battery pack in the floor. The truck is also designed to give the driver a lot of visibility, and even if he or she isn’t paying attention, the trucks will have the Enhanced Autopilot suite, able to keep their lanes and automatically brake. If the driver is incapacitated for some reason, the truck will slow, pull over, and call emergency services. “This is a massive increase in safety,” Musk said. Technically, many of these technologies already exist for truckers, or at least in the private-passenger automotive space. Together, they point to a future of fewer car-tractor-trailer collisions but more stuff to recalibrate and are another point in favor of both heavy-duty and regular collision repair facilities preparing for such a new reality. 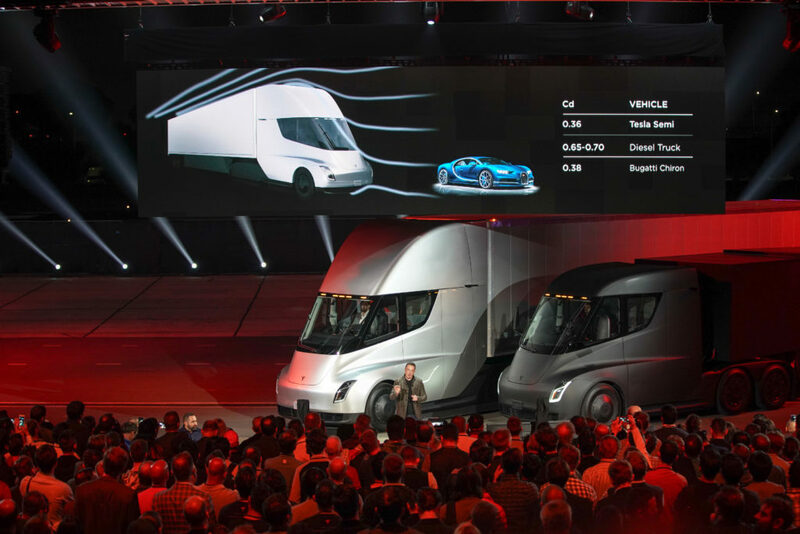 Though Tesla’s electric Semi tractor-trailer was the star of the live show Thursday, CEO Elon Musk also teased two vehicles of interest to body shops focusing solely on private passenger vehicles. Musk described an electric pickup truck version of the Tesla Semi. “It’s a pickup truck that can carry a pickup truck,” Musk said. He said it would be driveable with a normal license. Musk also showed off the new Roadster prototype, which does 0-60 mph in 1.9 seconds, has a range of 620 miles, and will have three motors, allowing for all-wheel drive. Its roof is also removable, and Reuters wrote that it is made of glass. Unlike the original Roadster, which Car & Driver wrote started at $98,000, the new version starts at $200,000. It was touted as being available in 2020. With the specs, range and price Musk described, it seems possible that the company could be looking beyond aluminum to carbon fiber for the body. 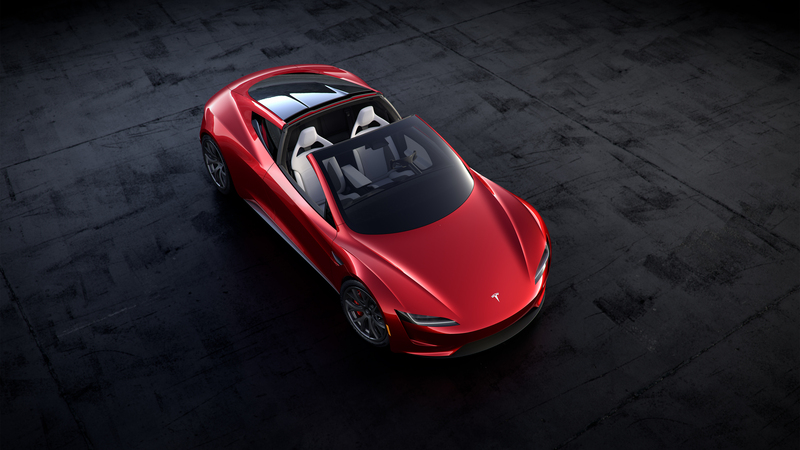 A Tesla spokeswoman declined to answer a question on the Roadster’s substrates.